It’s time for another Cute Outfit Ideas of the Week! This one is dedicated to the ever so versatile infinity scarf. I have a slight love for scarves, especially infinity scarves. They can really complete an outfit and take it from….you guessed it – drab to fab. An infinity scarf can go with just about anything. For today’s feature, I paired it with three different casual outfits. These cute outfit ideas for fall are perfect for a date night, shopping excursion with the girls or even running errands with the kids. See all three below and tell me which fall outfit is your favorite. Which one of these outfits are your favorite? I’m partial to the Aztec Cardigan one at the moment and only because that’s on my wish list. 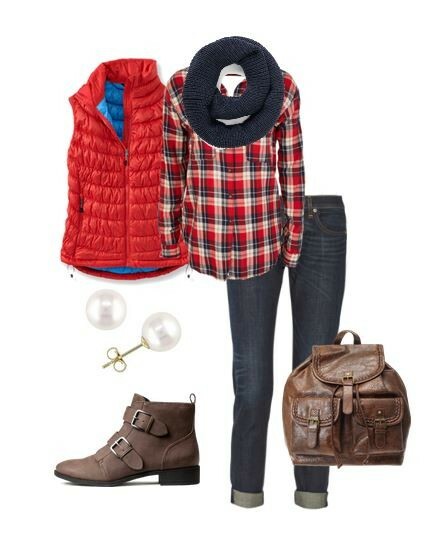 Get more cute outfit ideas every week here on MomFabulous! I’m such a blue jeans gal that these outfits are perfect for me! I really like scarves too, especially in the fall. I think I like the vest and plaid shirt outfit the best.